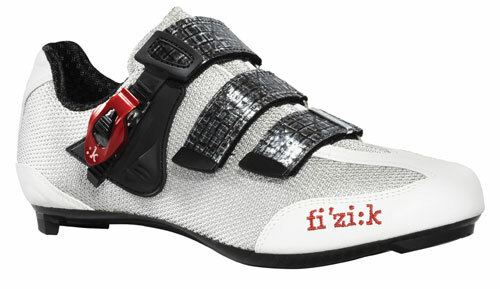 Italian brand Fizik unveiled its first road cycling shoes barely two years ago, which, compared to its know-how when it comes to saddles, is but a few pedal revs. But it has moved a long way in a short time and in 2013 there will be road shoes for men and women as well as mountain bike and triathlon specific models for men and women too. 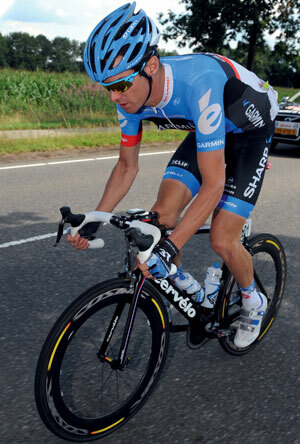 In 2012 there were, for example, eight pro road teams using Fizik kit and next year, we are told there will be more. 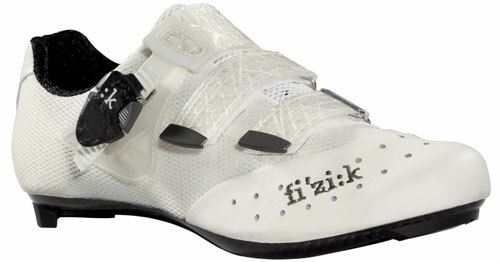 Fizik’s staff didn’t shy away from admitting that they had a lot to learn when it came to shoes and the early versions of the R1 were said by some critics to be too narrow and tight with a high instep and not enough ventilation. Two years on, those issues have been addressed. To be fair, a shoe which combines carbon fibre, sail cloth straps, carbon buckles, MotoGP-spec abrasion resistant nylon mesh and kangaroo leather is unlikely to be found in the bargain bin of your local bike shop any time soon. In terms of road shoes, there are three new shoes to chose from: the top of the range R1 thence to the R3 and the ‘entry level’ R5. The R1 and R3 are built on the same carbon sole, but the R1 uses more kangaroo leather, features a carbon buckle and comes with a French-developed SIDAS mouldable insole already inserted as standard. It costs about €100 (£80apx) more than the R3 because, according to Fizik, “there’s more kangaroo leather and more labour and stitching involved in the production, plus the SIDAS insole is €69 (£56) on its own,” which seems credible. The SIDAS ‘3-D’ insole is warmed up and rendered malleable before you plonk your feet on it to enable it to mould to your precise foot shape. Left to set for a couple of hours, its inserted into the shoe and you have a bespoke footbed comprised of several different elements, including an ‘anti-vibration’ segment on the ball of your foot and superior heel and instep support. It’s worth pointing out that a SIDAS insole will probably fit in most shoes, if you need to upgrade your existing kit. The R3 shares the same stiff carbon sole but has a (replaceable) aluminium buckle and little more mesh rather than leather on the upper. The fit remains the same and the weight (size 41, without cleats, is 302g) is light without being the lightest on the market, assuming that’s an important issue for you. The tongue in the R1 and R3 can be packed to fill out the shoe to your precise personal taste and the SIDAS 3D insole can be fitted as an aftermarket option – as indeed it can to the entry-level R5 (as well as the totally new mountain bike and triathlete shoes available in 2013). The R5 has a marginally higher stack height (“a couple of millimetres,” said Fonte, it actually measures 6.5mm) than the R1 or R3 (which measures 4mm) and has a carbon-reinforced nylon sole married to a Microtex and nylon mesh upper. There’s no sailcloth on the straps either and the (replaceable) buckle is alumnium. The R5 is almost half the price of the other two road shoes but offers far from half the performance. In use, on the pedal, the less rigid sole is barely noticeable, in fact, it’s only when walking the relative lack of rigidity is apparent and the fit is not noticeably different from the other more expensive shoes either. The R3 and R5 shoes also come in women-specific fit (R3 and R5 Donna) and Fizik is focusing on the balance between comfort, performance and fit. The SIDAS soles, the packable tongues allied to the straps, which can also be trimmed and tailored to fit all point to an attention to details. The soles on all the shoes – whether carbon or nylon – are marked up to make it easy to align cleats and the shoes are compatible with all the major pedal systems. The shoes, it goes without saying, are not cheap, but they are all made in Italy (and when are hand made Italian shoes ever going to be cheap?) and, considering the research, development and materials involved, the prices are a little more understandable. The R1 and R3 are immaculate conceptions in footwear but the R5 shouldn’t be discounted. 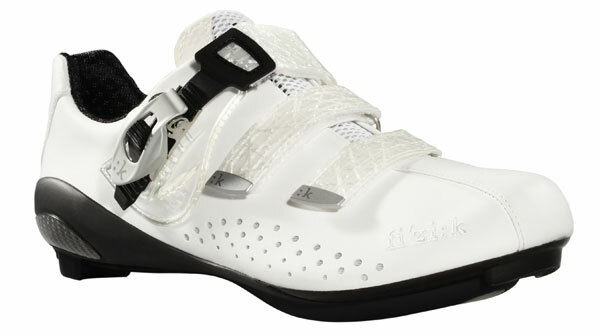 The white R5 fitted with a custom moulded SIDAS footbed looks like a million Euros and riding the R3 on one foot and R5 on the other didn’t show up the R5 as a cheap imitation, wannabe shoe. 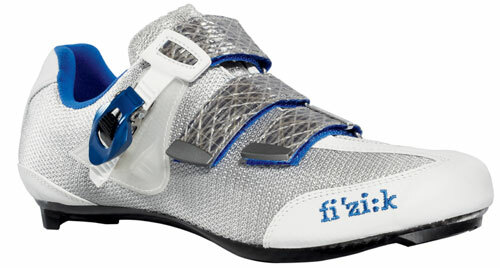 A broader fit, a customisable level of comfort, quality materials and Italian manufacture – that more or less sums up Fizik 2013.